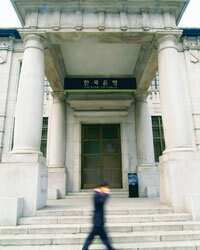 In control: A man walks past the Bank of Korea in Seoul. The bank kept interest rates unchanged on Thursday, causing the won to fall. Hong Kong/Manila: Asian currencies slipped as a US slowdown and increased credit market losses prompted investors to reduce holdings of riskier emerging market assets. The won fell as the Bank of Korea kept interest rates unchanged on Thursday, joining other central banks in the region that are concerned that the slowdown in the US economy, one of Asia’s biggest buyers of its goods, may crimp regional growth. “There’s some more risk aversion and that’s affecting the won today," said Sebastien Barbe, a currency strategist at investment bank Calyon in Hong Kong. “It’s perhaps best to stay cautious." The won declined 0.3% to close at 908.50 on Thursday, according to Seoul Money Brokerage Services Ltd. The won strengthened to above 900 against the dollar for the first time in a decade last week. South Korea’s central bank governor Lee Seong Tae and his policymakers on Thursday kept the overnight call rate target at 5%, in line with economists’ estimates. The won pared declines after the central bank said inflation will continue to increase, suggesting they’ll raise borrowing costs to curb rising prices. Eight of the 10 most actively traded Asian currencies outside Japan slipped against the dollar after US equities dropped to the lowest since September. American International Group Inc. (AIG), the largest US insurer, and Morgan Stanley announced more subprime mortgage-related losses on Wednesday. The Philippine peso declined 0.1% to 43.29 per dollar in Manila, according to Tullett Prebon Plc., the world’s second largest inter-dealer broker. It earlier fell as low as 0.8% to 43.61 per dollar. “The sentiment on the equity market in the US is weighing on the peso," said Ricky Cebrero, treasurer at East West Banking Corp. in Manila. “Portfolio managers abroad will get out and not invest in risky asset classes." Elsewhere, the Thai baht was little changed at 33.97 in onshore trading. Taiwan’s dollar added 0.2% on the Taipei Foreign Exchange, to NT$32.308, and the Indonesian rupiah lost 0.2% to 9,144. Vietnam’s dong declined 0.15 to 16,086. Markets in Singapore and Malaysia were closed on Thursday on account of a public holiday.